I was always a strong student, but once I got a ZERO in participation on a 9th grade history assignment. Allegedly, I hadn’t contributed to the class discussion — despite listening carefully and raising my hand in an effort to get a word in edgewise! Obviously, I am still bitter about this. Participation points have always been a hot-button issue for me, as a student and a teacher. How do you quantify what essentially boils down to be a personality trait? At my first teaching job, I was required to make participation 25% of the grade. I had no formal system for evaluating participation and basically just ballparked a percentage based on my perception of the student (which is a terrible grading system!). At this school, I was suspicious that participation served to inflate students’ grades and pass along unprepared students to the next level of Latin (a required subject). At my second teaching job, I had LIBERTY! No one told me what to do or how to grade, and that was fine with me, a seasoned second-year teacher. I didn’t give many participation points that year. My grades were based largely on academic performance. But grading participation can be beneficial. It makes the class much more enjoyable if students are engaged and contributing, and I increasingly felt that students should be rewarded for their engagement. The only problem was, I didn’t want to penalize students who were quiet but engaged (like I had been). I decided to grade participation, but give equal credit for quiet engagement, active contributions, and collaboration during group work. In other words, you could be painfully shy in my class, but as long as you were listening and working well with your group, you could still get an A on participation. It was not going to be like my 9th grade history class. I put the system in my syllabus, and the students were definitely attuned to the fact that their participation points were REAL — especially when I walked around the room with the gradebook during classwork and group work. However, it was exhausting to compile everyone’s weekly participation grade. From the random assortment of dots and X’s, I had to add and subtract until everyone had a weekly grade out of 10 points. This was the last thing I wanted to do on a Friday afternoon. I probably shouldn’t have graded participation weekly — that was a little too frequent. But it also would have been nice if some magical device — like a computer — could have done all the mundane calculations for me! When I decided to pursue software full-time, this was the first app I wanted to make: a participation gradebook. I wanted to learn backend programming and databases so I could learn how to store a roster and grades. You can track points over the week, quarter, or semester — it’s up to you. You choose the starting points and total points achievable for every student (e.g. everyone starts at 60/100 for the quarter, and they can earn up to 100 points). As your students do classwork or group work, you can update their scores with the click of a button from a computer. Everything is calculated for you. You can even add comments on each student’s page to reference in comment cards or parent-teacher conferences! Teachers are encouraged to value quiet engagement as much as active contributions. Each week, quarter, or semester, you can reset all your students’ points — but don’t forget to record the scores in your gradebook! 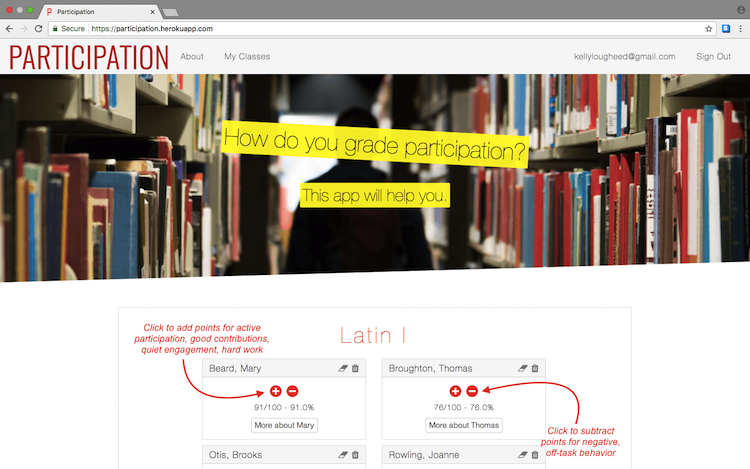 Participation is meant to be the high schooler teacher’s version of ClassDojo and help with grades, comments, and parent-teacher conferences. It sends students the message that participation points are real and must be earned, which in turn can lead to more active and engaged classes.